Manchester United face Wigan Athletic on Saturday for what is on the face of it an easy fixture, but could easily turn into a banana skin without the right application. The Latics will be hoping to avoid their 13th straight defeat against league leaders United since their return to the top flight, whilst the reds will hope to cement the gap between them and second-placed side, Arsenal. Sir Alex has a few tricky decisions to make in light of a hectic fixture schedule in March, including a trip to Chelsea and a trip to Anfield in the coming week. The excellent Smalling should continue in the heart of the defence alongside Vidic, though Brown’s inclusion wouldn’t be a surprise given the week ahead. Rafael should earn a recall at right back, as Fergie will be looking to see if he is in peak condition, both physically and mentally, ahead of the journey south on Tuesday. There is a similar predicament in midfield where Fergie may well be tempted to rest the likes of Scholes and Carrick. Gibson has performed well in his last two outings and could thus get the call in alongside Darren Fletcher. Giggs is fit again and will probably be given game time, and the influential Nani will probably start given the limited options Fergie has out wide at present, with injuries to Park and Valencia. Up front, Owen and Hernandez will be fighting it out to replace a tired Rooney who may be given a rest. For Wigan, coach Roberto Martinez will know that the collective psychology of the players will essentially be more important than the team selection; But nonetheless, aside form Cleverley (on loan from United) and Boyce (hamstring), Martinez should have a close to fully fit squad to choose from. As ever Rodalllega will lead the line well, offering pace, power and some great footwork on the ball, with some diligent runs off it; Smalling will perhaps seek to combat his movement in much the same way as he did versus Carlos Tevez recently, where he sought to deny the forward any space at all once he had taken his first touch on the ball. Rodallega’s movement will be similar due to the nature of the 4-2-3-1 formation that Wigan deploys, and Smalling may well have to work in tandem with both Vidic and Rafael to marshal the Colombian forward. Behind Rodallega, the promising Watson will alternate with McCarthy in central midfield in getting forward to join the attack. Diame, though able to play box to box, will start the deeper of the midfield triumvirate and seek to disrupt the flow of Man United’s attacking play. In the chalkboard below you can see how Diame focused much of his play down United’s right hand side where Nani operates. In the wide positions N’Zogbia and Moses should start on the right and left respectively; though as you can see from the chalkboard, N’Zogbia is comfortable on either side of the field and can be just as effective cutting inside from the left on his right foot than he is hugging the touchline and attempting to pass the fullback before crossing. I wouldn’t be surprised to see he and Moses alternate throughout the game, and even see N’Zogbia come central in search of the ball – as well as being an astute dribbler of the ball (and he is the most fouled player in the Premiership to date), the Wigan player is a threat on either foot from long-range, including at set-pieces. United’s 4-4-2 system will seek to exploit the wide areas which will inevitably appear given Wigan’s set-up. The chalkboard below depicts the area of the field where Wigan had most joy in stemming United’s rhythm, deep and central (with Caldwell and Alcaraz providing a third of the interceptions!) – in fact a recurrence on Saturday will not be entirely surprising as Wigan may seek to sit deep with 9 players behind the ball, searching to punish United on the counter. 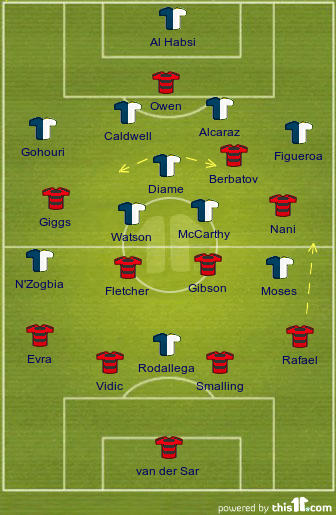 Rafael and Evra then will seek to join Nani and Giggs at every opportunity and provide an outlet on the overlap; and Figueroa in particular could be targeted due to his attacking instincts (and resulting positional weakness) as well as his relative lack of pace. This game could be tighter than expected as Wigan will be psychologically ready for the visit of United, and the likes of Rodallega seeking to make amends for being carelessly sent-off in their previous encounter. The game could be decided in the wide areas where N’Zogbia and Nani have had tremendous success for their respective clubs this season. If Owen or Hernandez start the game alongside Berbatov, the latter player will revert back to a deeper lying creative remit and his intelligence on the ball could provide the crucial opening. Referee: Mark Clattenburg – Was under scrutiny again recently as he correctly awarded a re-taken penalty from which van der Vaart missed. Refereed well in the midweek fixture between Napoli and Villareal. Hi Worbo – possible for sure – any tactical insight as to how? Great preview Nik but I am a bit concerned that Owen is starting offside! My team vs Wigan: VDS-Evra Vida Smalling Raf-Giggs Fletcher Carrick Nani-Chicha Berba.Go for it with aim of finishing the job 1st half then bring on Obertan and Pogba for Giggs & Nani second half. Maybe Owen for Berba too. Another great preview Nik, I always look forward to reading them prior to a match. The problem with this fixture is that it is clearly the least onerous out of the 3 this week, but at the same time one that SAF cannot afford to take lightly. If we presume United will play 3 in CM versus Chelsea, then I cant see two of the three, i.e. Carrick Scholes or Fletcher playing today? So perhaps Gibson alongside one other? Likewise it seems that Rio may not even be back for Liverpool, so does SAF play Smalling 3 times in a week? Wes would be my personal choice today. Giggs probably starts ahead of the lacklustre Obertan due to the sparsity in that area, though again, SAF may well play him today and then again v Liverpool, with Rooney left midweek? Chica does deserve a start, and probably edges it over Owen, but given Fergies comments yesterday and the fact I thought he was quite effective showing some good touches v Saints, he may well get the nod. (Now Im sure we will see Berba Roo! hahah!). Good stuff as usual Nik. I went for 2-0 too but with the pitch being new and our woeful away form then I am not overly confident. Lets just get the three points with no injuries and get set for next two massive games. 7 points in next 3 games would be great but certainly have to step up a bit away from home.